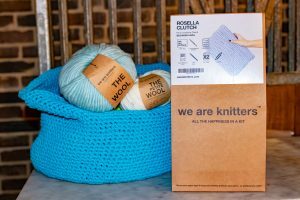 Yesterday saw the UK Launch of Knitting Kits from the brand we all love We Are Knitters. It was a cold day so it was the perfect day to make something warm to wear. When I arrived at the Riding House Café, Table Room I was super excited to realise I would be making (or trying to make) my first snood. 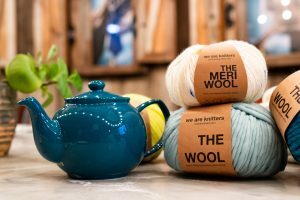 I sat at a table filled with Women, Maria and Alberto to learn how to knit and also find out why the brand was created. 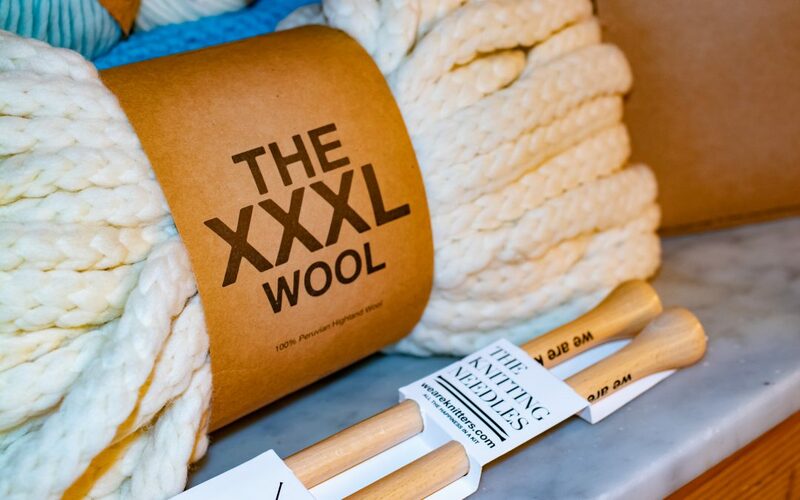 The Knit kits which come in an eco-friendly bag (reusable and recyclable) contain all you need to start your knitting journey (wooden knitting needles or crochet hooks and sustainable yarn). Ranging from beginner kits (i.e scarves and scatter cusions) to more advanced designs and techniques, all with instructions (available in 11 languages). There is no reason why you cannot join the knit party. I sat at my table after having a few snacks and delved into my kit which contained ‘Hand painted Sprinkle’ wool. Did I also mention that the knitting needles are 100% Beechwood so you are being environmentally friendly too, goodbye plastic knitting needles. I took out my carefully stitch by stich instructions and my knitting needles and set to the task at hand making my snood. At first it was the quietest event I had been to this year as every person sitting was concentrating on how to knit. Luckily for us, Pipeta and Alberto were on hand to help if we were stuck or if you are like me and get entangled. However, there are online tutorials if you need extra help at home. After we got into the knit of things the chatting began and we learnt about the sustainability of the brand. Founded in 2011 by Maria Jose Marin and Alberto Bravo, We Are Knitters is available in 20 countries. 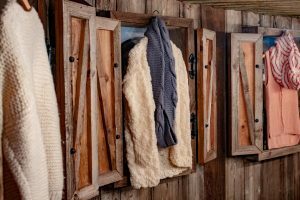 There are a variety of Yarns (made from leftover fabric) available including Peruvian petite wool yarn, Merino Superwash, Pima cotton yarn, Baby Alpaca and Tape yarn, all 100% natural. The wools are available in the widest range of colours and new season colours have been released: Yellow Neon, Ochre, Marshmallow and Skylovers. After 45 minutes of knitting I had managed to complete 10 of my rows and was feeling super relaxed. It was very therapeutic and I understand why knitting is said to lower your heart rate and induce a state of calm. Not to mention the room was filled with everyone encouraging each other. I would count this as my first knit party but it won’t be my last as they are holding their first UK knit party in Brighton on the 31st of January. I aim to have made a few of the kits by then. With Blue Monday coming on the 21stof January (what we Brits class as the most depressing day of the year) it would be a good idea for you to get involved and find some #Knitspiration. I love a challenge and after finding out about the arm knitting technique I am on a mission to master it. Not to mention the fact that it is a family activity with Knit kits available for children, my household will be picking up the knitting needles and dropping the technology. After an interview with the founders it was time for me to head home with my new Knit Kit. I went to see the family and my mum was wowed that I had actually managed to complete my first few rows. I myself cannot wait to finish it so I can take some awesome selfies with my new Snood. 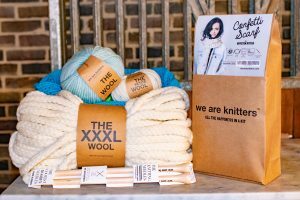 If you fancy a challenge or even just a new way to relax then go get yourself a Knit Kit and send us a photo. After all that’s what the Knit community is about sharing your creations with other people, that and staying warm.